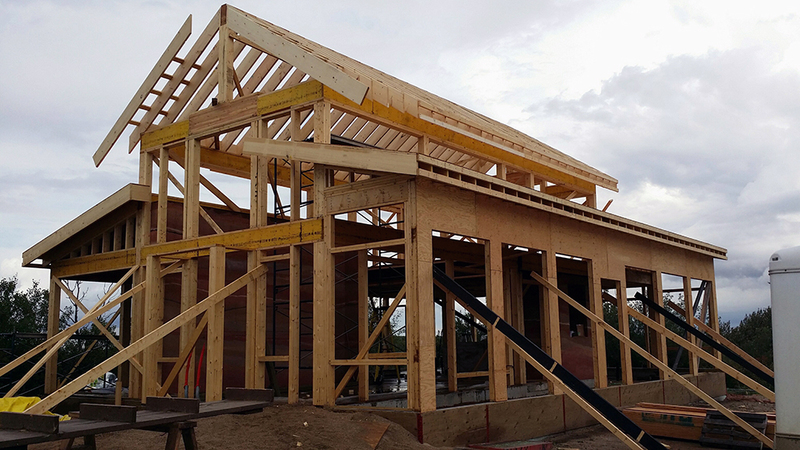 Lance Olson and Wendy Wright’s self-sustaining Buffalo Lake cottage was built with help from SAIT’s Green Building Technologies. Nestled atop a hill overlooking the pelican reserve at Buffalo Lake, the name “Pelican Perch” seemed like a logical one for Lance Olson and Wendy Wright’s dream retirement home. 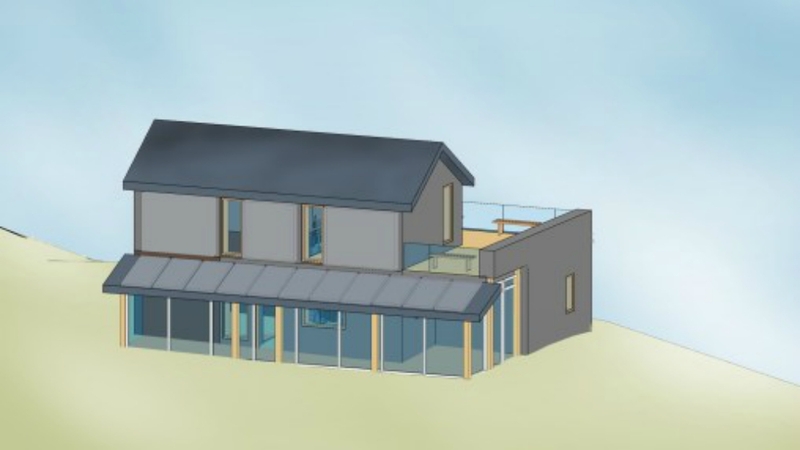 But far from building a standard lake cottage, Olson and Wright have teamed up with SAIT’s Green Building Technologies (GBT) to make the home net-zero energy. He and Wright approached GBT in July 2015. GBT is a research division of SAIT that includes researchers working with professionals and students on projects like renewable energy and energy-efficient construction. “The work we do is typically on the ‘bleeding edge’ of technology, where industry is not yet making money and is not yet super comfortable,” explains Rebecca Davidson, GBT’s principal investigator of net-zero design. Construction broke ground in June and will soon be finished. Here’s how it’s progressed so far. 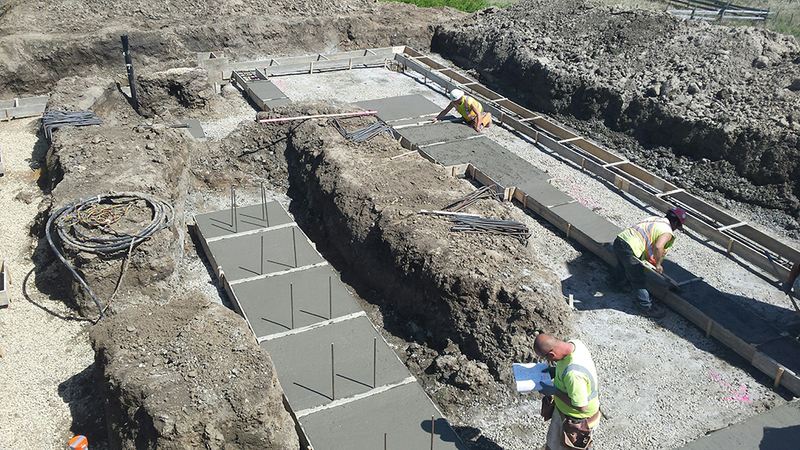 In one of the home’s early stages, workers build the thick footings that will support the central rammed-earth walls. Homeowners Lance Olson and Wendy Wright came to Green Building Technologies prepared. “I did about five years of reading about green building,” Olson says. “I came up with the design, and I needed someone to check my math and make sure I did it right.” After a few tweaks, the project went ahead. Olson is the facilities and operations manager with Arts Commons, while Wright teaches at the School of Alberta Ballet. They plan to move into the home when they retire, but it will be a vacation property while they’re still working. Pelican Perch’s rammed-earth walls are a modern version of the ancient building technique of densely compressing earthen material. 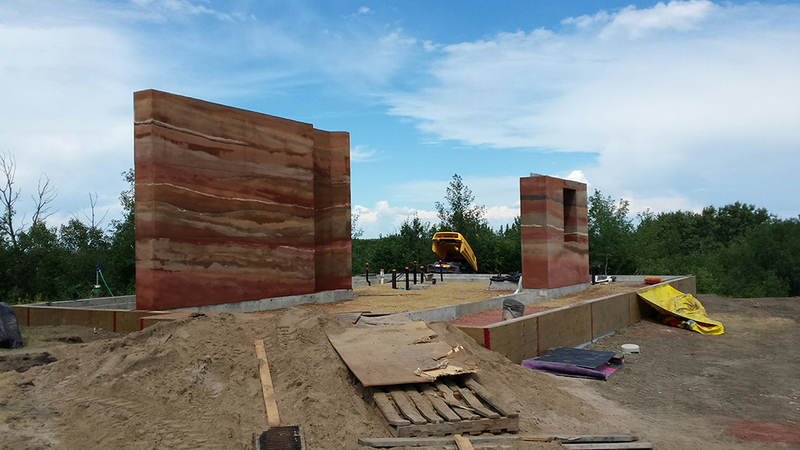 “Parts of the Great Wall of China are made with rammed earth,” Davidson says. Stabilized with rebar and mixed with cement, they’re incredibly sturdy. They’re also environmentally friendly and locally sourced by Innovative Earth, an Alberta-based company. Embedded with heat-wicking hydronic loops, the southern wall will channel heat energy into a boiler in the mechanical room. The beautiful layers of colour, which come from the pigment in the different kinds of earth used, will be on display. “They’re basically the artwork for the house,” Davidson says. 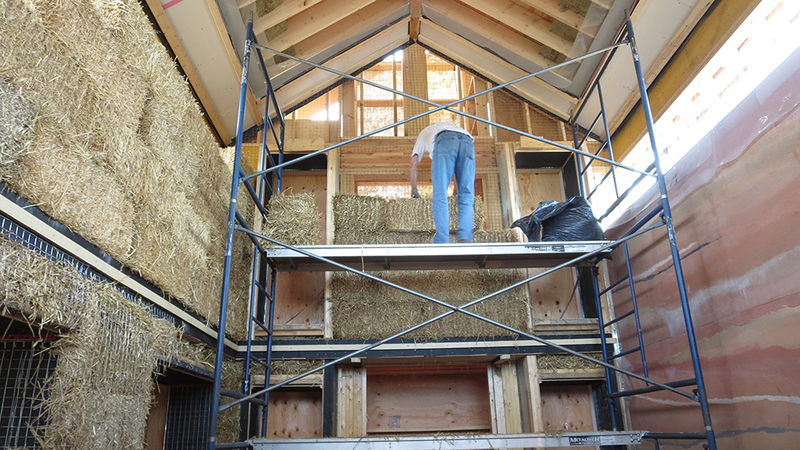 Olson installs wire mesh in his retirement home’s straw-bale walls, which are essential for winterizing the home. The bales are then stitched together and given a cement stucco scratch coat, plaster and paint. They’re highly insulated, well above what industry standards require, which means they’ll keep the house cool in the summer and warm in the winter. They’re also solid. “If they’re properly sealed and maintained, there’s no reason why they shouldn’t last 100 years – longer than the lifespan of many normal homes,” says Davidson. 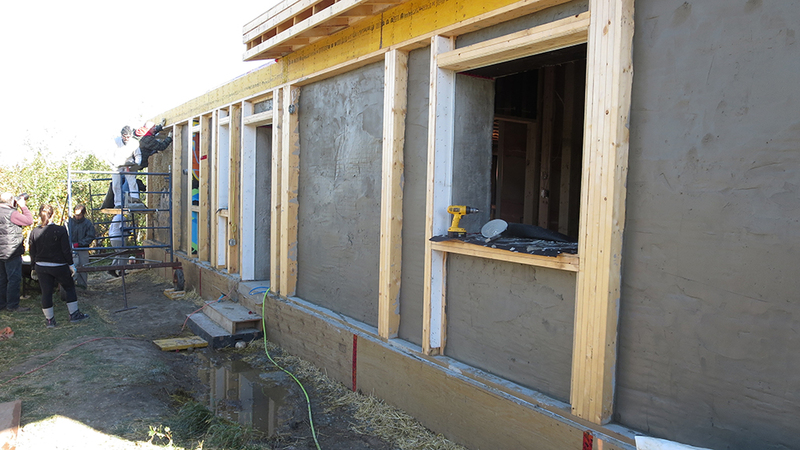 The home’s framing, straw-bale insulation and rammed-earth walls are up, and some of the windows are installed. Most of the exterior is plastered, and the roof will be added next. 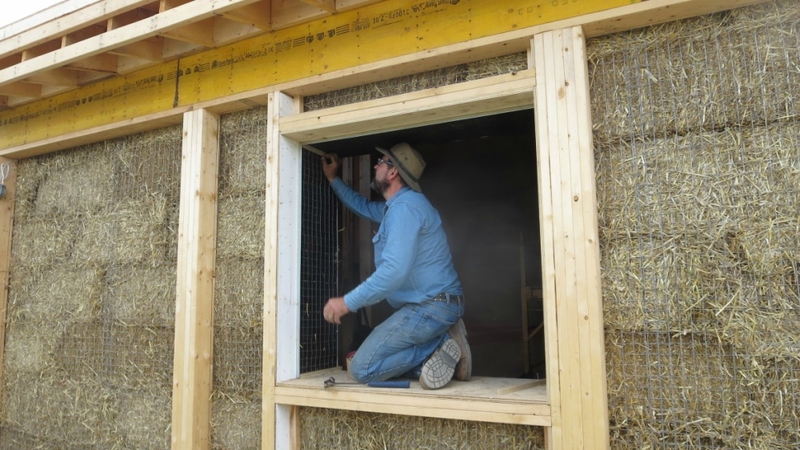 A net-zero energy home is more costly and labour-intensive to build than a regular one, but for Olson and Wright, the long-term energy savings and lessened environmental impact make the investment worth it, especially since they plan to sell surplus energy back to the grid. This artist’s rendering shows what the finished home will look like. The balcony, which will offer spectacular views of the lake and the prairies, was an addition to Olson’s design by the GBT team. The project is a little behind schedule thanks to the heavy rain the area received this summer, but Davidson hopes the straw bales will be finished soon. “It’s really important that we get them in and sealed up and protected from the elements before winter,” she says. Her team will step back once the interior of the house is ready to be finished and furnished with energy-efficient appliances. If all goes according to plan, Olson and Wright hope the home will be live-in ready by spring 2017.